Senate Majority Leader Mitch McConnell (R-Ky.) is expected to move ahead with a procedural vote as early as Tuesday to take up the health care bill that narrowly passed the House in May. Apparently short of votes even to begin that process, President Donald Trump continued to pressure Republican senators to get on board. “Republicans have a last chance to do the right thing on Repeal & Replace after years of talking & campaigning on it,” Trump wrote on Twitter Monday. After nearly seven months of planning, debating and legislating, much of it behind closed doors, the Senate this week has apparently reached the moment when votes will have to be cast. The fight on the Senate floor will unfold in stages. 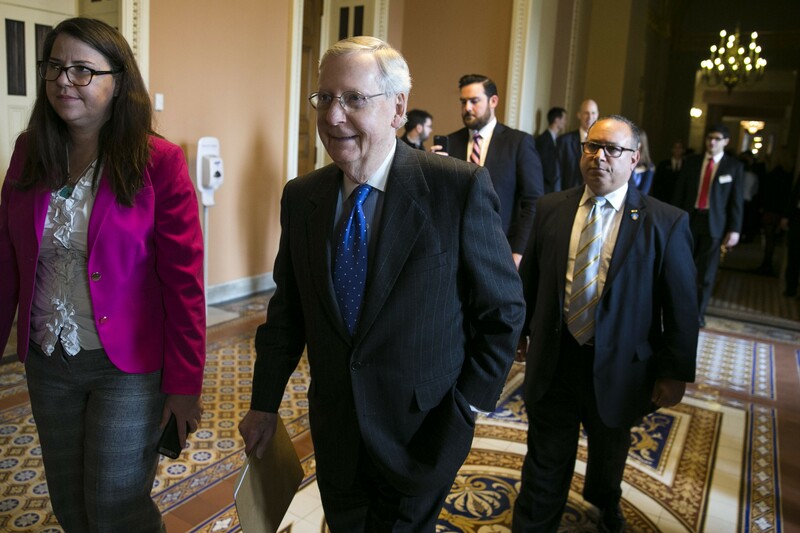 First, the Senate majority leader, Mitch McConnell of Kentucky, is expected to move ahead with a procedural vote as early as Tuesday to take up the health care bill that narrowly passed the House in May. If that vote is approved, the Senate would begin debating a bill to repeal and replace President Barack Obama’s signature domestic achievement, but nobody expects that measure to reach a final vote. Instead, if McConnell can muster 50 votes to begin debate on the House bill, he could quickly move to substitute it with an entirely new bill to repeal the Affordable Care Act without a replacement. If that amendment vote fails, as expected, he could move to replace the bill that was passed in the House with a health bill that has been worked out in closed-door negotiations between Republican senators. None of that would happen if senators vote against the motion to proceed, and at the moment, McConnell still appears short of the votes. He can afford to lose only two Senate Republicans, or only one if Sen. John McCain of Arizona, who announced last week that he has brain cancer, is absent.